What is subtly demonstrated in the above drawing is that in front of a desktop sits a fashionable lady who is staring at the screen with shocked expression wearing on cheeks and huge sweat dropping from her forehead. 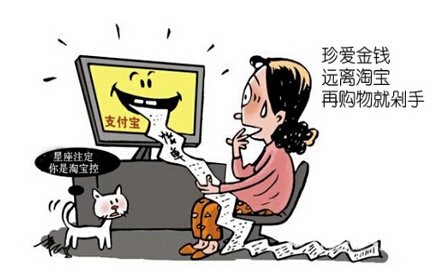 What is spit from the computer is the lengthy Alipay bill, which can almost be spread as long as two meters. The caption above reads that you should keep away from Taobao and cherish your income. The objective of the drawer is to show us that utmost attention should be paid to shopping online, which has exerted profound impact on the daily life of the average individuals. We can easily recognize its advantages: e-commerce, which is extremely convenient, can save us a great amount of precious time and we can buy products everywhere we want as long as we can surf online. However, for all the advantages mentioned above, online trading is by no means without its limitations: we may be cheated by some online retailers, which might be a potential threat to our bank accounts. Accordingly, it is imperative for us to take drastic measures. For one thing, we should appeal to the authorities to make strict legislations to severely punish those who deliberately spoil the interests of online customers. For another, we should enhance the awareness of residents that rational purchasing is conducive to our income management. Only in this way can we maximize the merits and minimize the demerits of online purchasing. As is shown in the picture above, innumerable people are sitting in their isolated rooms, surfing on the Internet. It seems that the Internet has connected people together, because they can chat with other people all over the world, but upon closer observation, we can learn from the picture that people have been separated from each other effectively, because the walls between them restrict them to their own world. The connotation of the picture is to remind us that while the Internet has brought a great deal of convenience and proficiency to us, it also acts as a barrier, prohibiting the face-to-face communication. Undoubtedly, the Internet has its minus and pluses, and it’s necessary to analyze its influences on our life. On the one hand, the modern technology represented by the internet does have its advantages, such as online shopping, online chatting, and online news, all of which enable us to obtain what we want without travelling thousands of miles, and shorten the distance between people. On the other hand, the dramatic technological changes that have provided us with more communication opportunities have also increased the risk that we will be more alienated from our relatives and friends. The people in the picture may feel lonely after a long time of Internet life. From the analysis above, we can come to the conclusion that we should treat the Internet with a reasonable attitude and use it in a proper way. While we enjoy the benefits provided by the Internet, we should not forget that the virtual net world cannot be a substitute for the real world. And we should cherish the intimacy of the face-to-face communication. Only in this way can we have a wholesome life. As is shown above, in front of a computer happily sits a teenager, attempting to work on his homework effortlessly, with the help from the internet finishing the job for him. There has been a heated discussion about this picture in the news paper recently. Simple as the picture is, it does demonstrate certain thought-provoking social phenomenon. The picture tells us that our life has been greatly influenced and changed by scientific and technological advances, an integral part(不可分割的一部分)to every aspect of modern life. What’s more, individuals, organizations and governments attach due attention to this phenomenon. On the one hand, the progress can enhance people’s understanding on a subject, improve people’s learning capacity and skills, shrink the distance between cities and even continents; smooth the communication between residents and rid of the barrier(消除?#20064;? between people. Technical advances offer all people in the world a quality of life what was unimaginable(不可?#23478;?#30340;) when personal computer first appeared 60 years ago. Our factory hums to the rhythm of robot assembly arms. In my view, while we are enjoying the conveniences of the science and technology, we should keep a watching -eyes on(注意、当心) those negative practice, and aim to reduce the problems it has caused. Then the benefits of these advances will outweigh the serious problems.